Bolise Co., Limited. is an ISO 9000:2001, GMP, Kosher certificated manufacturer of Herb Extract, natual food colors, Natural Preservatives and Supercritical Co2 Fluid Extraction Machine with over 10 years history. 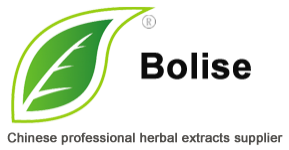 We mainly devotes to sale popularizing and research and services of natural products, and promote the development of natural herbal industry. For more information of product, please Welcome to www.bkherb.com. Durchschnittliche Wartezeit auf einen Termin: Eine Woche. Bolise Co., Limited. ist durchschnittlich aktiv. Dieser Eintrag ist aktuell. Bilder von Bolise Co., Limited. Produkte & Dienstleistungen von Bolise Co., Limited.